Drs. Ke and Imai developed a new type of tissue clearing agent, SeeDB2. 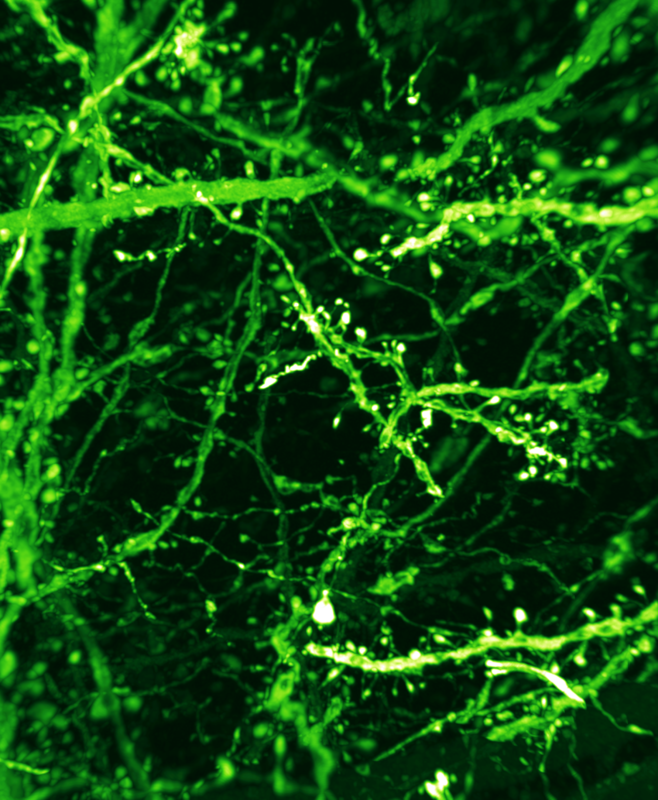 SeeDB2 is ideal for high-resolution three-dimensional imaging of fluorescent proteins. SeeDB2G and S are designed match the refractive indices of glycerol (1.46) and oil (1.52), minimizing spherical aberrations for high-NA glycerol- and oil- immersion objective lenses, respectively. SeeDB2 is particularly powerful in confocal and super-resolution microscopy using high-NA objective lenses. It is noteworthy that many of fluorescent proteins are highly preserved in SeeDB2, much better than in PBS or other commercialized mounting media optimized for fluorescent dyes. Thus, SeeDB2 is also an ideal mounting medium for samples labeled with fluorescent proteins. SeeDB2 is useful not only for thick brain tissues, but also for thin samples for cell biology or tissue sections. Clearing Solution 1 Step 3. Clearing Solution 2 Step 4. Figure1 . Mouse brain slice (adult, 1.5mm-thick) before and after clearing with SeeDB2. Figure 2. Confocal images of brain slices from a Thy1-YFP (line H) mouse. An oil-immersion objective lens (NA 1.4) was used. Note that fluorescence level did not decrease even though laser power was constant throughout depth. Scale bars are 2μm. Dr. Takeshi Imai. et al. developed a water-based optical clearing reagent, SeeDB (See Deep Brain), which clears fixed brain samples in a few days without quenching many types of fluorescent dyes, including fluorescent proteins and lipophilic neuronal tracers. SeeDB is a saturated solution of fructose in water with thioglycerol. This method facilitates comprehensive and quantitative analyses for understanding neuronal circuitry, both in the adult and developing mouse brain. SeeDB:20w/v% Fructose Solution Step 2. SeeDB:40w/v% Fructose Solution Step 3. SeeDB:60w/v% Fructose Solution Step 4. SeeDB:80w/v% Fructose Solution Step 5. Figure 2. 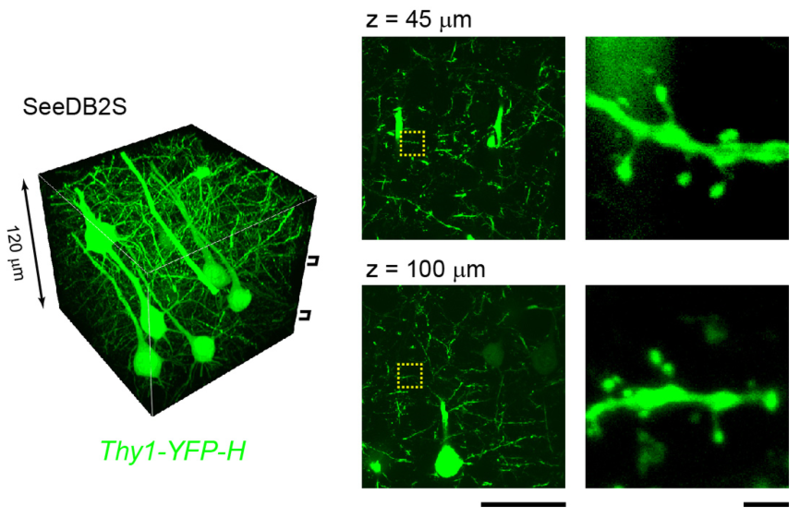 Imaging of Thy1-YFP(H Line) mouse brain after SeeDB process using Multiphoton microscope and Multiphoton dedicated objective :OLYMPUS, model:XLPLN10XSVMP. Figure 3. Imaging of Thy1-YFP(H Line) mouse brain after SeeDB process using Confocal microscope and objective :OLYMPUS, UPLSAPO 10X2. The See through chamber is an observation container used when observing tissue cleared samples with a microscope. 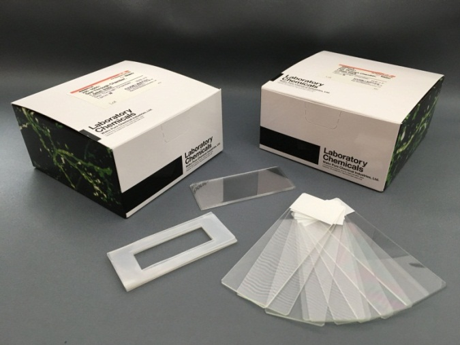 The See through chamber is composed of 10 sets of silicon rubber sheets, cover glasses, slide glasses processed to make it easy to observe tissue cleared samples. There are five kinds of thickness of silicone rubber which becomes the spacer, 0.3 mm, 0.5 mm, 1.0 mm, 2.0 mm, and 3.0 mml, and it is possible to select the optimum size according to your samples. The silicone rubber sheet has a protective sheet affixed on both sides, it can be used in close contact with slide glass and cover glass by peeling off at the time of use. Ke, M. T., Fujimoto, S. and Imai, T. : Nat Neurosci ,6 (8),1154 (2013). Ke, M. T., Fujimoto, S. and Imai, T.: Bio-protocol 4(3), e1042 (2014). Ke, M. T., and Imai, T. : Curr Protoc Neurosci ,66,2.22.1-2.22.19 (2014).